Sabudana Khichdi is completely a new recipe for South Indians. Western states of India like Gujarat, Maharashtra, Rajasthan and Madhya Pradesh, it is made during their fasting day. We, South Indians, do not eat anything that is cooked during fasting. So we consider it as a special dish and make it on special occasions. I learned it from my sister in law and also from my neighboring aunt, who is a Marathi. So I learned it in two ways. My sister in law makes it with lot of coriander leaves, but aunt from whom I picked it adds very little of it. My husband and kids like the later one only. On a Saturday evening, want to make a one pot dish then it is the best choice. Normally every Saturday night dinner I make specials like dosa, pitchatlu or rawa dosa. So this week also I thought of making a very simple and easy to make dish for night dinner. 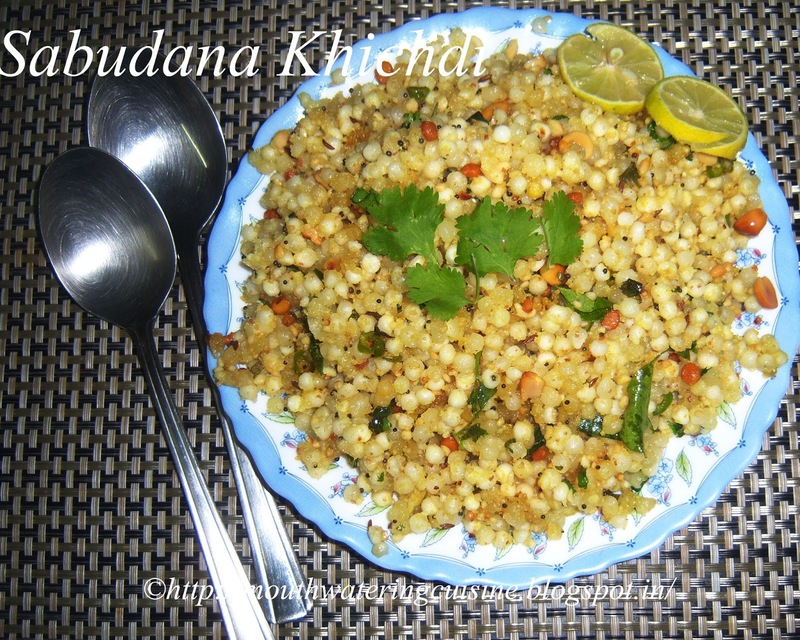 So thought of making Uppu Pindi, sojja pulihora or even more simple khichdi. I gave a choice to all members of the house, all voted for sabudana khichdi, which is not in the list though. :) I have no option but to make it. Soak sabudana/pearl tapioca for three to four hours. Before soaking it wash it thoroughly. White residue should be thrown out and all the water should come clear. The sago grans should be separate and moist. Just sprinkle water with regular intervals, so the grains become fluffy and grow bigger in size. I sprinkled water for every 30 to 45 mins. We need to do it for at least three to four hours time. Roast groundnuts. Keep some of them separately for further use and make a coarse powder of rest of it. Chop green chillies and coriander leaves. Heat oil in a kadai, add mustard seeds, cumin seeds, black gram and bengal gram. Add groundnuts also . When they started spluttering add green chillies, coriander leaves and curry leaves. Add salt and turmeric powder. Stir well. Add soaked sago. Stir well. Add groundnut powder to it and mix well. Allow this to warm for a while and switch off the flame. 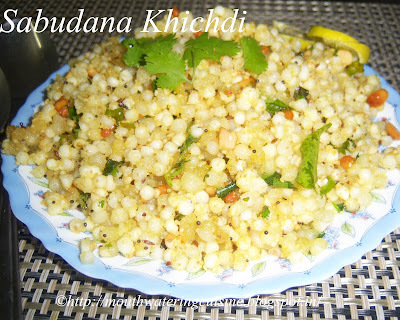 Serve hot sabudana khichdi with curd or as it is also it tastes nice.